You love the styling of classics but keen to make the switch to electric mobility. If this sounds like you then a small company from the Czech Republic may have just what you’re looking for. 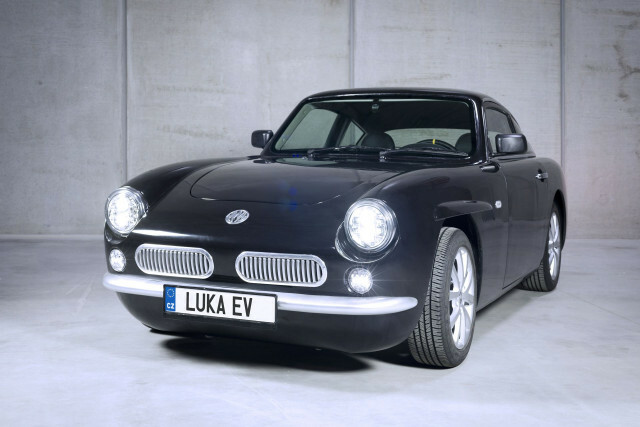 MW Motors, located an hour’s drive southwest of Prague, has revealed the irresistibly cute Luka EV, which the company bills as the first production car to be powered by in-wheel electric motors. The car started out as a research project for MW, which was looking to develop lightweight and novel solutions to make electric cars much lighter. The resulting developments were so promising that the company had to put them into production, and the Luka EV was born. There’s a clear resemblance to the Karmann Ghia up front, while the rear looks to have taken inspiration from the Aston Martin DB4. There’s even a bit of Mercedes-Benz SL when viewed from the side thanks to the front fender detailing. At 160 inches in length, the Luka EV is about 3.0 inches shorter than the Ghia. Things are more modern inside thanks to digital screens and carbon fiber trim, though there’s still a very retro look to it. The Luka EV seats two and is built on an aluminum frame, with composite materials used for the body. Power comes from four electric motors, which as mentioned earlier are positioned in each wheel hub. They deliver a combined 66 horsepower. The output doesn’t sound like much but MW was able to keep weight down to just 1,800 pounds. Because the car’s structure was so light, a big battery wasn’t needed. The Luka EV uses a 21.9-kilowatt-hour lithium-ion battery that MW says will provide a range of 186 miles on a single charge. The company also quotes a 0-62 mph time of 9.6 seconds and top speed of 90 mph, and while you won’t be winning any races with those numbers the car should still offer a lot of fun thanks to sophisticated traction control and torque vectoring systems made possible by having an electric motor at each wheel.